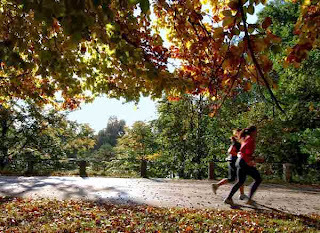 Things got off to a slow start this week due to the Royal Parks Half leaving me with super achey quads and hamstrings. I'd expected a bit of soreness on Monday, but was well and truly suffering from a case of the dreaded DOMS (delayed onset muscle soreness) by Tuesday. I don't normally suffer from muscle soreness the day after a training run, so this was a stiff reminder (pun intended) that I should only run a race hard if I've had chance to build up the miles in my legs beforehand. My 'Tuesday Legs' left me unable to run until Wednesday morning and even then it was a bit of a struggle to get going as I gingerly ran the commute into work. My route to work is roughly 5.5 miles door-to-door and has always been an excellent way to both get some base miles in and avoid the rush hour. It's also the perfect run for slightly sore legs in need of recovery because I find that the backpack I wear naturally restricts me to a little over 8 minute mile pace. After getting rid of the remaining tightness in my legs, as well as the last vestiges of my cold, I repeated the morning run commute on both Thursday and Friday. There was a noticeable chill in the air on both mornings as Autumn appeared to be well and truly setting in just a few days after the Royal Parks Half bathed in sunshine. Given that things are only going to get damper and chillier from hereon in, the first thing I did upon reaching work on Thursday was to visit Wiggle and order some new tights and a pair of gloves. Anyone who has trained for a spring marathon will know that vest and shorts just don't cut it during the winter months, so I'm sure that won't be my last kit purchase before Christmas. I also supplemented this week's running with a swim and two Pilates classes. I've been doing Pilates for around eight weeks now and it's fair to say that I'm pretty useless at it. Like most men, I suffer from an inability to straighten my legs whilst they're up in the air, so I attract a lot of tellings off from the class tutor. But I'm sticking with it because I think it's a really good, structured way to work on my core and stretch out some vital running muscles such as the hamstrings and hip flexors. I learnt this week, however, that I'm going to have to be careful about which classes I decide to follow with a run. A couple of weeks ago, for example, I went to an hour-long morning class full of stretching exercises and immediately followed it up with a swift ten miler. I honestly felt like I was floating on air the whole way round as my muscles were warm and my strides were relaxed. Fast forward to this weekend and my experience couldn't have been more different: the hour-long class- taught by a stand-in tutor- was solely made up of core and glute work. This, of course, would normally be considered a good thing as both are vital to strong running. Unfortunately, having spent the duration of the class struggling to keep my legs in the air, my quads were burnt out by the time I hit the road for a twelve miler and it was a real struggle to keep myself going at a decent tempo for the duration of the run. So, if you ever have a bossy middle-aged lady standing in for your usual Pilates tutor, do what I should have done straightaway and... run! Full details of this week's training are logged under the Tim's Training tab.